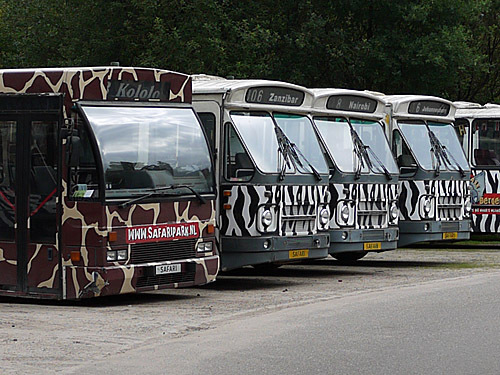 Students of the Master's program Chemical Engineering were asked to come up with a solution for the not environmental friendly buses of Safaripark Beekse Bergen. Safaripark Beekse Bergen is a special kind of zoo. The animals are not kept in little cages, each species separated from the other, but the structure is based on the natural habitat of the species. This means that animals that live in the same habitat in nature are kept in the same area. The safari park facilitates a bus tour from the south to the north side of the park and vice versa. These buses have a relatively large smoke production and are not environmental friendly, because they emit much CO2, soot and NOx. This damages the image of the park, because Safaripark Beekse Bergen has a very strong image regarding their attitude towards nature and animal welfare. The students gave several options for reducing the environmental pollution generated by the buses, like a diesel particulate filter or using hybrid buses. They performed this research within the framework of the so called Multidisciplinary Project (MDP).